I have previously estimated iPhone sales by region and my methodology has proven to be quite effective. However, this year we need to take into account a few external factors. 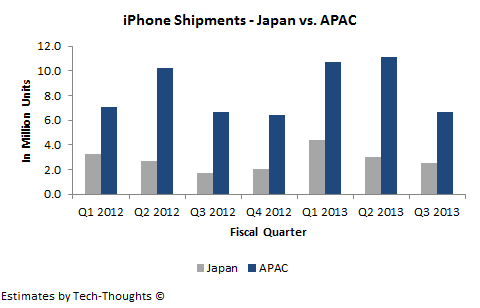 Apple has added or is on the verge of adding the largest carriers in Japan (NTT DoCoMo) and China (China Mobile). Therefore, we also need to attempt to understand factors that could affect incremental iPhone sales from these carriers. These figures should have a minimal impact on overall iPhone sales, so I'm not very concerned with the accuracy of DoCoMo's smartphone estimate. 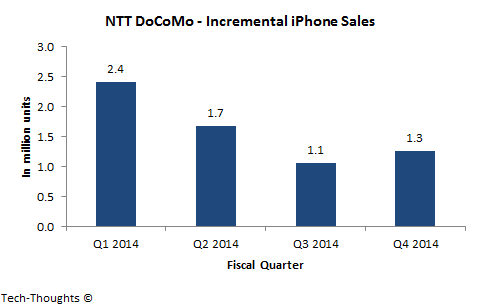 In contrast with NTT DoCoMo, estimating iPhone sales at China Mobile is far more challenging. 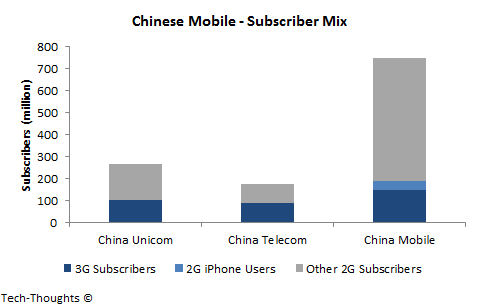 The chart above shows the 2G-3G subscriber mix at Chinese carriers. It has been said that about 70-80% of Chinese customers buy devices off-contract. If we use this figure with China Mobile's subscriber base, we get ~520-600 million off-contract subscribers. If we assume that all 2G subscribers are off-contract (not necessarily a good assumption), we are left with a market size of ~150-200 million subscribers for all subsidized smartphones (not just the iPhone). Unfortunately, this may not be representative of the addressable market for iPhones because we have very little information about income levels. We do know that China Mobile has about 42 million iPhones running on its network using older GPRS/EDGE connectivity, of which at least 27 million have been purchased in the last 18 months. This seems to be the "core" iPhone market because these subscribers have the requisite financial means and also seem loyal to the brand. These unlocked phones are bought from the "grey market" at unsubsidized prices (mostly smuggled from Hong Kong because of lower import duties). With China's unique subsidy structure, this creates a situation where the upfront cost of buying an iPhone from the "grey market" is actually lower than buying one from a carrier. Therefore, compatibility with China Mobile's 3G/4G network is likely to be a bigger factor than pricing. However, it is difficult to gauge the volume of incremental sales driven by 3G/4G support, especially in countries like India/China. I know that some analysts are still very optimistic about China Mobile's iPhone sales, but few seem to appreciate the degree of uncertainty. At this point, I seem to have more questions than answers.